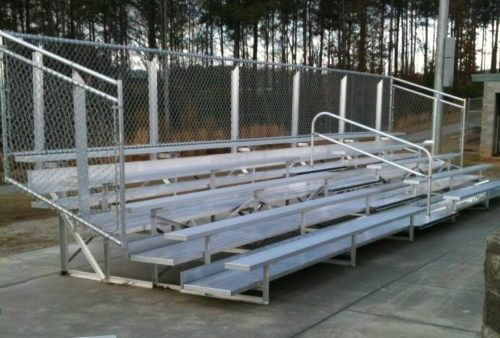 When you’re in the market for aluminum bleachers, you already know that one size does not fit all. Different organizations have vastly different requirements in indoor and outdoor bleachers. 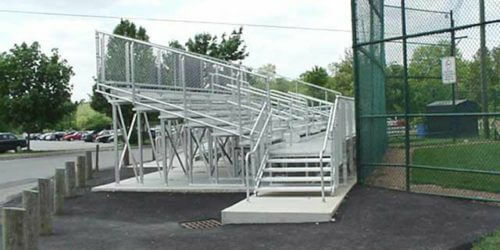 At SightlinesBleachers.com, we offer the selection you need to meet your distinct requirements. Just explore our product line and you’ll see for yourself why we are the source to rely on when you need aluminum bleachers, aluminum picnic tables and more. With more than 30 years experience in the industry, we serve customers throughout the United States and beyond with the very best in aluminum benches, bleachers and other related products. Our commitment to quality and our dedication to customer service have made us a leader in the industry. 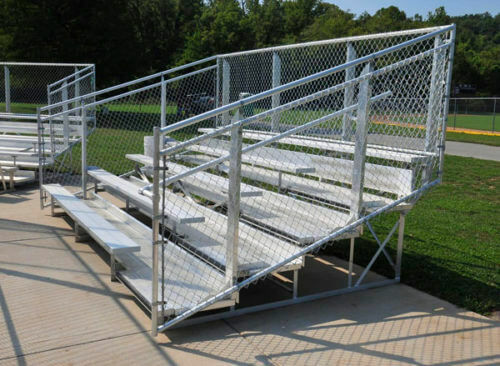 Three and four row bleachers – When you don’t need seating for a stadium-sized crowd, these aluminum bleachers should serve your purposes perfectly. 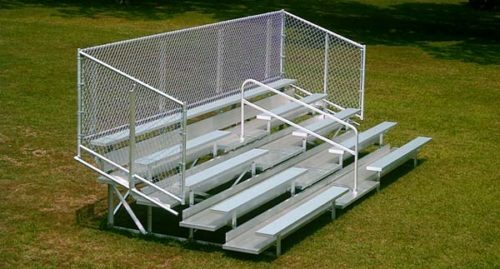 This category includes outdoor bleachers with a seating capacity of 15 to models designed to comfortably hold up to 72. All of our designs meet IBC Code, so you can count on quality and we always keep our pricing competitive. Tip and roll – When bleachers don’t need to be set up all the time, these portable designs offer the perfect solution. We offer multiple designs in these convenient aluminum bleachers with seating capacity numbers that range from about 15 to 54. 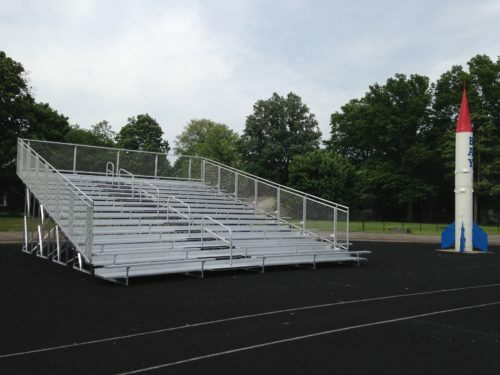 Five, 10 and 15 row bleachers – This part of our product line is ideal for community and school sporting installations. 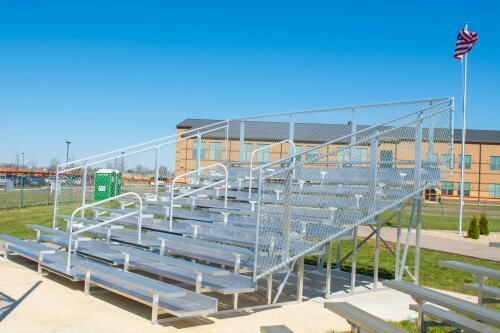 Our aluminum bleachers in this line range from five-row models that seat about 42 to 15-row designs that offer seating for up to 214. 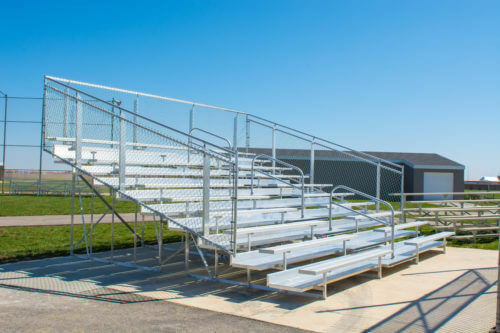 All of our outdoor bleachers and indoor designs offer the safety features you demand and are built to meet or exceed IBC Code for safety. Five and 10 row elevated – Providing fans with elevated viewing is a great way to keep them coming back for more. 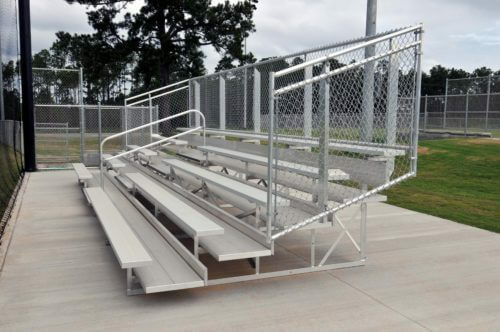 Our aluminum bleachers deliver with a wide variety of options in five-to-10-row models. Seating capacity on these bleachers ranges from 54 up to 184. 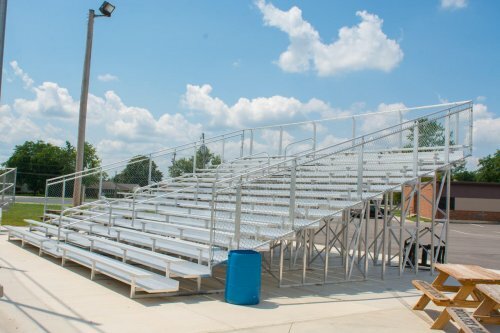 Transportable – When you need to be able to transform a field into a viewing area and then break it all down again, these aluminum bleachers provide the flexibility required. Our transportable designs include models that seat about 42 up to those meant to hold about 144 people. These designs meet IBC Code and offer easy installation and breakdown. 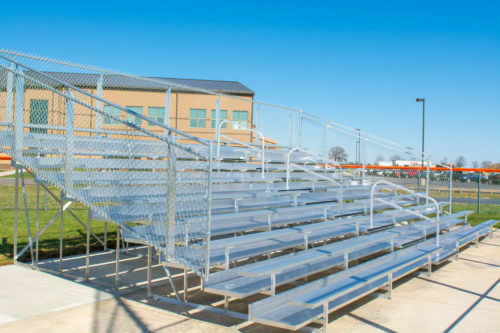 Purchasing aluminum bleachers is not a one-size-fits-all proposition. When you require a specific design, SightlinesBleachers.com is here to serve. We invite you to shop our selection of models to find the style that suits your needs. Don’t forget to check out our aluminum benches for players and our aluminum picnic tables, too. When you’re ready to order outdoor bleachers or indoor designs, just shop online for convenient delivery to your location. You can also contact us personally at 1-800-609-1545 for service. We’re always happy to answer any questions you might have about aluminum bleachers.